Driving to Asiago, at the heart of the Altopiano of the same name, gives always an impression of getting out of the “contemporary world” and of entering another dimension. This does not mean that the small towns of this plateau (also called Altopiano dei Sette Comuni, since it gathers seven municipalities) are stuck in the past, on the contrary. Asiago for example is equipped with all facilities and opportunities one can wish for a nice vacation. Nevertheless you immediately feel that the sense of time and space are quite different from that of the near plain of Bassano and Vicenza, and even quite different from that of the near valley of the river Brenta or the mountain region of Trento. It hinges on the fact that the Asiago plateau, like many others plateaus, has developed over time a sort of autarchic management of the local natural and human resources. There are of course historical grounds for this situation, being the Altopiano the settlement of a minority from the Cimbri tribe, with its own language and a huge political and economical autonomy till the XIX century. There are also geographical grounds, since Asiago was hardly accessible (even today, when you can drive on comfortable roadways, it takes quite a long to reach Asiago from the near Bassano) and used to be isolated from the rest of the world for a large part of the year (the winter is really very cold and snowy!). Stated in short, if in the mountain valleys and regions you have always the perception of a uninterrupted relation with the plain southwards or with the biggest centers, i.e. cultural and economical intersections, of the Alpine region, the Asiago plateau seems to be trained to stand alone or at least to look at the northern or southern connections, even if essential, as something peripheral or accessory. This is the reason why this region offers even today an unspoiled nature and – which is here the point – a particular historical memory related to the Great War. The Asiago plateau is in fact one of the few places in Italy which have endured the WWI at the front line throughout the conflict, i.e. for more than 40 months. The old border line between Italy and the Austrian-Hungarian Empire ran before WWI along the northern limit of the plateau. As in May 1916 the Austrian Commander in Chief, General Conrad von Hotzendorf, decided to start the Strafexpedition (Punitive Expedition) against the former Ally, now treacherous Enemy, the tableland of Asiago stood obviously in the middle of the aggression and, at the beginning of the conflict, was invaded. The Austrian advance toward the southern edge of the Altopiano, which represented a sort of springboard on the Venetian plain, was however arrested at the beginning of June 1916. The Austrian Army was so forced to retreat and to fix the front line from the northern slope of Monte Pasubio, across Monte Zebio, just at the back of the town of Asiago, and, turning than north, over Monte Ortigara (the situation changes after the Caporetto rout, shifting the front line southern on the Altopiano and straight over the Grappa range and the river Piave). No surprise then if you find trenches and monuments – especially military cemeteries – related to the Great War almost everywhere here. However the visitor is impressed not only by their number, but also by the unique scenery, they are placed in. The isolation and autarchy of this region get along with a deep care of the natural landscape. Pastures and woods are meticulously farmed and protected, and yet still respected in their spontaneity. It’s a sort of symbiosis between humans and nature which embraces also the traces of the tragic events of WWI, so that you have the strange feeling of peace and deference, even while visiting the trenches or the military cemeteries. And a newly restored itinerary through five war cemeteries was the goal of our spring excursion. Unfortunately the weather condition weren’t good enough to walk it completely. We suggest therefore today to our readers only a part of it as a foretaste and postpone the itinerary through the war cemeteries and the trenches of Monte Zebio for a while. The itinerary is very simple, last about 3/3.30 hours all together, and is accessible for everybody in good physical shape (you just need suitable shoes). Starting point, from Asiago few kilometers towards Trento, is the hamlet of Camporovere. Park in front of the church of Camporovere and walk shortly backward, with direction Asiago. On your left you will find a small road with the brown sign indicating Forte Interrotto. Follow it and reach the meadows, which immediately climb the slope behind the houses. We suggest to walk first along the road, crossing then the grove of Monte Rasta and reaching in about 30 minutes the Forte Interotto. The imposing structure of this military base – which is only erroneously called Fort – was build during the second half of the XIX century. 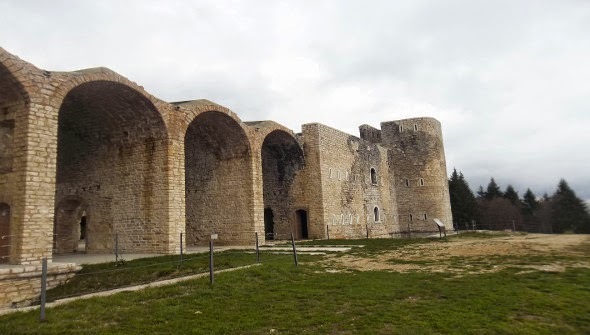 Completely made of stones and based on medieval building models (it looks like a castle, indeed), the structure was a perfect observation and defensive outpost, dominating the wide valley of Asiago, and was equipped therefore with machine guns and cannons. It was occupied by the Austrian Army only during the attack of may 1916 and connected with Monte Rasta, where an armored observatory was immediately placed. Till the end of the Great War it served also as billet for the troops and if you walk short in it you can easily recognize the rooms used as dormitory, kitchen, stable and as food water or ammunition storage. Informative placards illustrate the history of Forte Interrotto and at the entrance show photos taken before and after its renovation as part of the project of an Ecomuseum Great War of the Pre-Alps of Vicenza. If you have time, we suggest to continue the excursion and reach in about 45 minutes the war cemeteries of Mosciagh following the so called Sentiero della pace / Friedensweg (a 68km itinerary on the trail of the WWI in the Altopiano). Behind Forte Interrotto take the forest road and at the first crossroad follow the path on the left with direction Colle del Mosciagh. After an immersion in an absolutely charming fir wood, you can easily reach a small monument dedicated to the Catanzaro Brigade, which served the Italian Army already in the terrible battle of May-June 1916 in order to stop and drive back the Austrian attack. A few meters beyond, two Austrian-Hungarian war cemeteries rest in a small dip at the feet of Monte Zebio. When we reached them, they were almost completely plunged into the snow – the photos evidence that an excursion here has to be planned for the late spring/early summer! But despite the weather conditions, it was worth walking among these tiny (wood and stone) grave markers, stumble upon the single name or the (always hard to swallow) number of Unbekannte – unidentified names, faces, story lives. And nevertheless, above all, the wood surrounds and protect this place, in peace and respect. The way back follows the same path to Forte Interrotto and than goes down, eventually across the meadows, to Camporovere. When you have reached the car, you can eat something in one of the restaurants in the hamlet or you can drive to Asiago, where there are many places to take refreshment. But, once you are here, don’t forget to visit the renowned War Memorial of the Great War: it is a will and a pleasure.